The car park is directly in front. Indoors you’ll find an array of paints, wallcoverings and fabrics, tools and equipment. And if we don’t have what you’re looking for in stock, we can order product into branch for you. If you’ve any questions, please do ask; our team is experienced, knowledgeable and helpful. We can also arrange local deliveries. The A505 is the main road cutting through Dunstable towards Luton. Once you’ve left Dunstable town centre on the way to Luton, shortly after the retail park on your right, you’ll see a large HSS Hire building to your left. 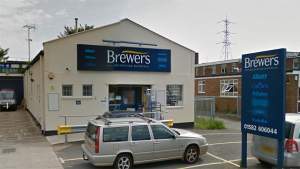 The Dunstable Brewers Decorator Centre is two buildings further on, between Supertyres and Red Autocentre. Travelling through Dunstable on the Luton Road A505, the store is on the road of off the A505 and runs parallel meeting Eastern Avenue. Turning left off of Boscombe Road on to the Luton Road A505. Immediately take the right hand slip road and the store is over the road on the right.